Eddie, I have some of those old Reno & Smiley Show on VHS....They broadcast them on RFD-TV Ronnie Reno's tv show. My first guitar was a Epiphone ES-335 hollowbody. My dad found it at the local music store in Culpeper Va. He put down $20 and had me pay the rest on layaway. I got it for $200 with case. It was red colored with humbuckers. Each week I would stop by the music store and put down $20 until I got it. When I got it I played the heck out of the Chet stuff day and night. I would always look at those Chet LP's and wished I had a Gretsch Country Gent. Hopefully one day I'll get one. Here is a photo. It's not a good guitar and has been hanging way up on a high wall in a remote location, untouched for a while as evidenced by the dust . Just touching it I started sneezing. 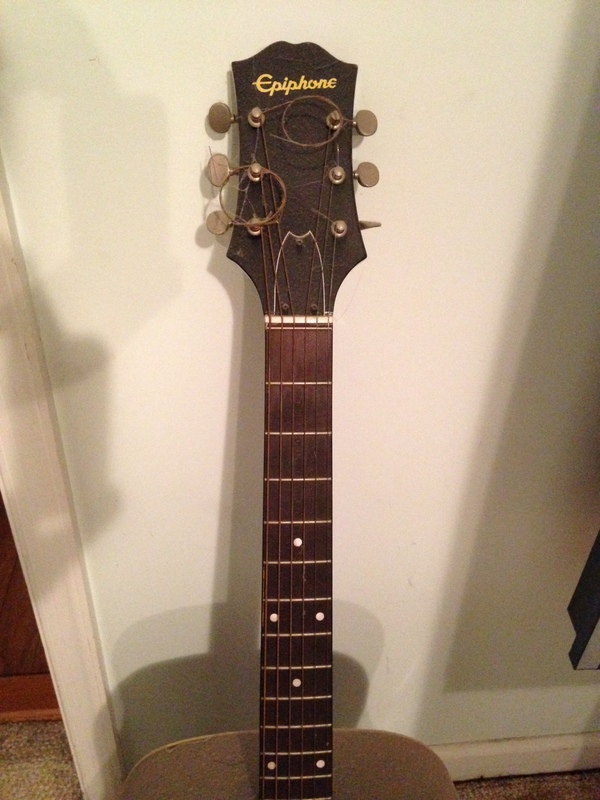 My first guitar was a late fifties Silvertone archtop acoustic, bought new. It was blue with a white area on the top. I have a picture around here somewhere of me holding it trying to look cool (I didn't). It got traded for a Les Paul Junior, which got traded for a Gretsch single Anni, which got traded for a Goya G-17 nylon stringer, which I still have. My first guitar was a little acoustic that had no bridge pins. Strings slid thru a slot on the bridge. Had no case with it. My Mom bought if from some guy by donating her hair to his organization. She had long hair and got it cut (not completely short) and gave me that guitar. I would have been 4 or so. Then a guy really wanted to buy it from us later on when I was 6 or 7. Had no case so it was really beat up. Then when i startes really playing I barrowed a Yamaha 12 string that had 6 strings on it, so that probably helped my hands for them tough chords. Then I bought my first actual guitar it was a strat copy that had like every screw stripped out on it, the string tension pulled the bridge right out of the slot! Not completely because the screws still had a little bite in them. Paid $120 for that guitar and an amp and chord. I got ripped on that deal, the guitar had grounding issues and never played well. Traded that (plus $) for a Samick 335 copy. Put a bigsby on it and its still my main guitar. Ill post a video with it sometime. Fun to think back on that. My first guitar was a Japanese electric which I did not learn to play on except for maybe a couple of 1st position chords and I gave up. It looked like a Fender Jazzmaster and it had a whole bunch of buttons to push besides volume knobs. A couple of years later my dad bought me another guitar, a Gretsch Rally which I did learn on and still have. The store that sold us the Rally sold it to us for the price of a new Country Gentleman (I did not know the difference and my dad did not play - he had 6 kids and buying that Rally for me was really hard). When we found out he would not take it back. Anyway, that guy is no longer with us and I'm thankful for that. Not sure what first inspired me to pick up my first guitar...but we had two laying around the house. One was a 70's I banes hummingbird clone, and the other was a Washburn d-28 copy. The Washburn was the one I cut my teeth on, learning from a Mel bay book. I guess I posted in this thread but never answered the question...lol. My grandfather was asked by a friend of his in 1933 to pick up a Kalamazoo arch top auditorium guitar and his friend would stop by later to pick it up and pay him. The friend never showed up and my grandfather was not a guitarist, and not even a musician of any kind. So he put the Kalamazoo in his attic. In 1954 I was sneaking around his attic and spotted the guitar. I had never touched a guitar of any kind before. I had been playing around on their piano a little and was always intrigued with harmony and tried to find whatever I could. My folks couldn't afford a piano. We lived 120 miles away from my grandparents, so I didn't have a chance very often to play their piano. When i saw that guitar, a light bulb came on and I noticed the 6 strings and all of those frets and though it might be possible to play melodies and harmonies together like I did on the piano. I had never seen anyone play a guitar other than to strum chords or play single notes with a flat pick. My ideas were exploring new territory for me. My grandfather saw my interest but didn't trust my perseverance so he bought me a cheap Kay guitar with horrible action and that was my first guitar and the one I painstakingly learned on. He waited for 10 years to finally give me his Kalamazoo. By then I was 15. I had already been aware of Chet and had been trying to play his style for 2 years but didn't really get the hang of it until yet another year. I guess I can say that the Kalamazoo was my first guitar to play Chet's style on.